Trooper Pierson was shot and killed during a traffic stop west of Panguitch. The 29-year-old victim had recently been transferred to the area and his patrol vehicle had not been equipped with the proper radio crystals. At approximately 10 a.m., Trooper Pierson stopped a pickup on Highway 20, unaware that it was the subject of a recent radio broadcast regarding a gas skip. As Trooper Pierson approached the vehicle, the 18-year-old driver shot him in the chest with a .357-magnum. 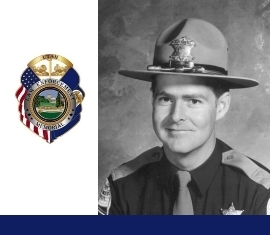 Although Trooper Pierson managed to return fire striking the vehicle, he succumbed to his wound at the scene. His body was found a few minutes later by a passing motorist, who used the police radio to notify authorities. Half an hour later, a pickup attempted to evade a police checkpoint on Interstate 15. Officers pursued it to Beaver where it was forced off the road. The 18-year-old suspect was slightly wounded. He subsequently pled guilty to first-degree murder. He is currently incarcerated in Utah State Prison. The son of UHP Sgt. Dean Pierson, Trooper Pierson was married and the father of two children. A third child was born three months after his death. Trooper Pierson is buried in Antimony City Cemetery. His bronze name plaque is sponsored by the Utah Highway Patrol Association. Today, I was a participant in the 2009 motorcycle ‘Ride for Utah’s Fallen’ with donations forwarded to fallen officer’s families. I did not know Patrolman Pierson, but am a friend of one of his relatives, a nephew, I believe. I’d like to note that there is, on a topographical GPS map of Mt. Dutton (near Antimony, Circleville, Bryce Canyon), a beautiful view from an area now known as ‘Pierson’s Point’, that, from what I’d been told, was named and dedicated in memory of Trooper Pierson. Thank you for your service, Ray Pierson, and may God bless your family. Lynn was my cousin. You would never find a nicer man than Lynn. We worked together at his mom’s cafe in Junction, Utah. Spent some time riding horses with him and his brother, Ricky. Lynn’s dad is my father’s brother. He passed away just s short time ago. I remember the outporing of officer’s for both Lynn’s and Uncle Dean’s funerals. What a great group of people the Highway Patrol are. They established a memorial plaque for Lynn and my son has seen it several times on his way hunting and taken pictures. I treasure those pictures and make sure my kids all know about Lynn. He will forever be in my thoughts.